These are the few things my mum would try to knock into my stubborn, hard skull. I never really thought much about it, until I started noticing the benefits of organic products, evidently in my complexion. No offence to mum, but I hate what she feeds me at home. But when we go for meals at Country Farm Organics, I hardly ever complain. The food is actually pretty decent here. 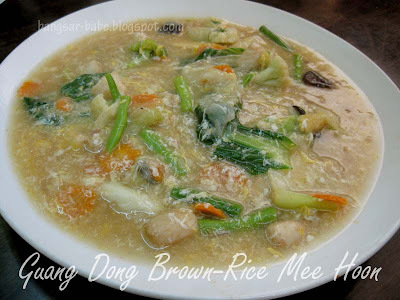 My favourite of the lot is the Guang Dong Brown-Rice Mee Hoon (RM13.90). 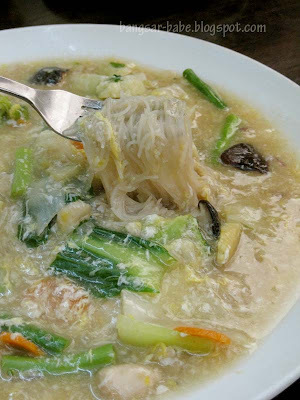 It has the consistency almost of a wat tan hor, but not as flavourful and minus the wok hei. The vegetables are sweeter and nicer. Most of my regular readers would know that I’m not a huge fan of vermicelli. 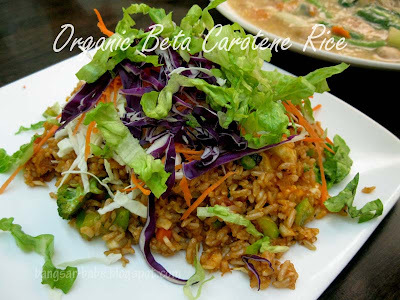 I prefer flat rice noodles, but that would defeat the whole purpose of going organic. Brown rice mee hoon is good for you. When I first saw how ‘green’ the Organic Beta Carotene Rice (RM9.90) and Organic Tom Yam Mee Hoon (RM7.90) looked, I almost didn’t want to eat them. I’m glad I did. My mum and sisters like the tom yam mee hoon better, but I prefer the beta carotene rice. 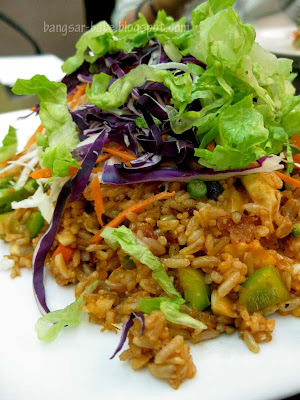 Surprisingly flavourful, the rice grains are bigger and firmer. It makes you more satiated. 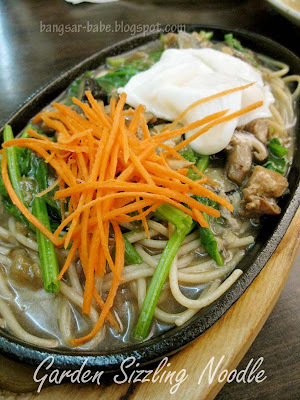 I didn’t care much for the garden sizzling noodle (RM9.90) because I was busy enjoying the other dishes. The gravy was a bit diluted and it was not as tasty as the guang dong noodles. “Finish your oat milk”, said mum. Sigh, she sometimes forgets I’m not a little girl anymore. 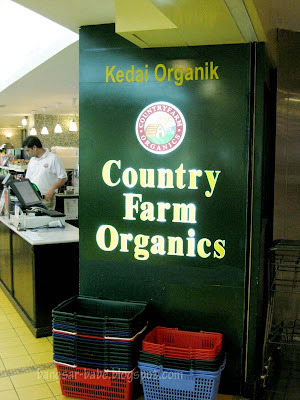 Though it is not the most flavourful of meals, the fact that I’m eating organic food makes me feel good. And I’m not ashamed to admit I like eating here. Verdict: If you want something wholesome, try this. I'll be most glad to indulge in this place. Guilt-free, healthy fare. With some twists. 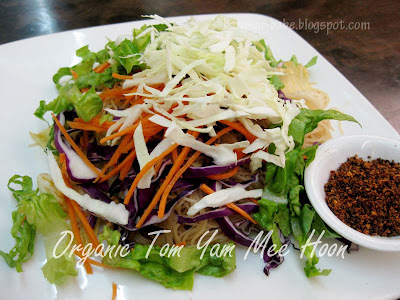 sulynn – yummie photos.. by that alone i would try the brown rice noodles! i tried one organic restaurant before…ordered the pan mee…i would say it is healthy but the taste will be taste weird without the minced pork …. but not for us ! errrr… doesn't sound nice… hahahaha.. probably for health benefits.. but that would defy the purpose of eating out eh? "Eat your vege", I can almost hear my mom echo 😉 Hahaha, everyone's mom is probably the same lar..
GinGin – It's quite decent…if you like your food healthy! 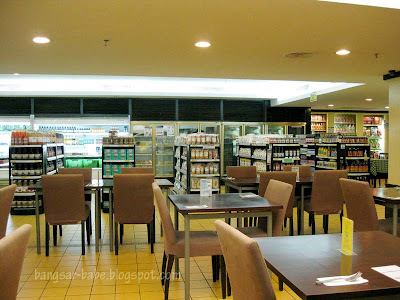 Tummy Rumble – Eating out isn't healthy, but this is one of the few places that serves healthy, organic food with no MSG. BSG – I know you la…you'd rather chug down a jug of beer!! Cumi & Ciki – Come we go have lunch there!